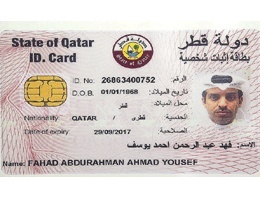 All Qatar residents should have smart card IDs by the end of this year or early 2009. They will then be able to get exit permits for themselves. The QR25m smart ID card project was started in October last year. To date, around 8,000 nationals have been issued the card. Also, the first Qatari biometric passports have been issued. Two fingerprints will have to be given as well as an image of the iris for the new ID. Biometric capturing is a key component of the Qatar National Identification System where the Ministry is building the National Biometric Repository which will contain biometric details of all citizens and residents. In keeping with the country’s paradigm shift towards e-governance, the new ID card serves as identification, but can also be used at the e-gates at Doha International Airport and will allow the holder to enter into transactions with the government online. The future plans also include incorporating a health card into the smart system.